How lucky we are to have such generous neighbors who share the bounty of their gardens with us! The other morning, a simple chat over a wooden fence with my neighbor in the morning while I was out walking my dog resulted in my coming home with a large bag of fruit. The tangerines had fallen from the trees due to the heavy winds from a recent storm. Would I like some? But of course! The star fruit need a little more ripening. “Just put them in a bowl and let them sit a while on the counter. They will be ready when they’re more of a yellow color. The yellower, the better.” They’re still ripening. My painting is a little off kilter. The coffee mug is a little crooked – but I like when there’s a slight shift of perspective in a painting that is not meant to be photorealistic but rather more impressionistic and stylistic. I drew and painted it in two nightly sessions. Our dwarf pomegranate trees are finally starting to show fruit but I plucked off these two before they were mature because they looked good enough to paint. Alas, they are not good enough to eat and perhaps are slightly blighted. Pencil first then watercolor in my Bee Paper Company sketchbook. Today, the Philadelphia Watercolor Society liked my Sand Salt Moon Facebook page, so I guess I need to start painting and posting some “serious” watercolor art to try and impress them, lol. In the meantime, here are some of my favorite summertime fruit. 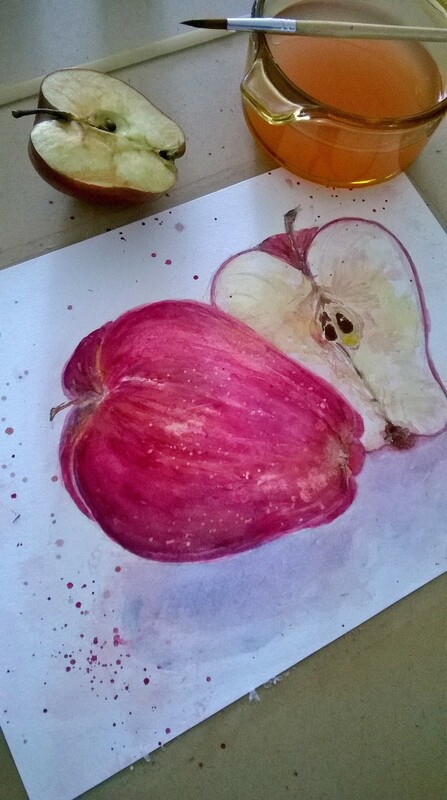 I thought this looked very “childish” whilst I was drawing it in my watercolor journal, but then after I photographed it I thought the skin on the fruit looks rather lifelike. That’s the point of a journal sketchbook – to experiment and try things out, even if it’s not a “painting.” From this little exercise in my journal, I explored color. 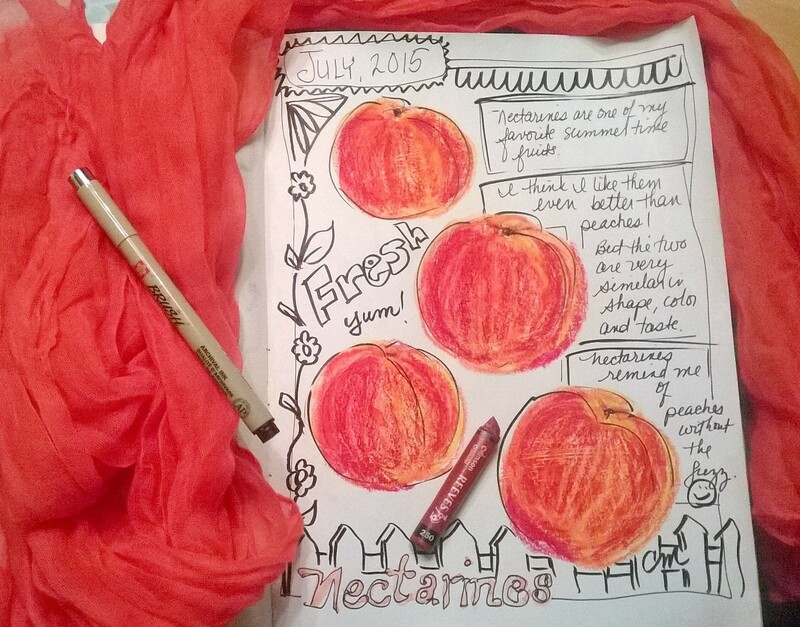 These nectarines were colored from memory, without looking at the fruit. I’ve eaten so many in my lifetime and love them so much, I feel confident just getting out my reds, yellows and oranges and having at it.